NewerTech's Voyager is being billed as the world’s first “Quad Interface” SATA I/II Hard Drive Docking Station with support for FireWire 800/400, USB 2.0, and eSATA for 2.5" or 3.5" drives up to 2TB. Basically, that means you can enjoy plug-and-play access to match your level of performance. It is also completely hot-swappable, so users can change drives while their computer is already running. At $100, it seems like a pretty decent buy—but if you can do without Firewire, a USB + eSATA Brando HDD dock with 4 card reader ports can be had for $79. December 2, 2008, Woodstock, IL — Newer Technology, Inc. (NewerTech®) http://www.newertech.com, the leading developer of PC, Macintosh®, iPod®, and iPhone® performance upgrades and accessories, today announced NewerTech Voyager, the world’s first “Quad Interface” SATA I/II Hard Drive Docking Station with support for four interfaces: FireWire® 800/400, USB 2.0, and eSATA. NewerTech Voyager turns any 2.5" or 3.5" Serial ATA (SATA) I/II hard drive up to 2.0TB into a fully bootable and hot-swappable external drive solution. Using Voyager is so simple: just insert any standard 2.5" or 3.5" SATA I/II hard drive (up to 2.0TB) into Voyager’s compact docking base and select the fastest of the four interfaces supported by your computer for read/write data speeds of up to 3.0Gb/s. There’s nothing else to install or configure. Voyager saves users the time and inconvenience of installing a hard drive into a computer or using an external hard drive enclosure with limited interfaces and slower speeds. With the most interfaces available on the market, Voyager provides Plug and Play ease of use for a fast external hard drive solution that works with both Macs and PCs. In fact, Voyager is so easy to use, that combined with today’s low cost of hard drive storage, users can think of a bare SATA I/II drive as being as convenient to use as a flash memory card, with the same instant access benefits and the addition of huge storage capacity gains. 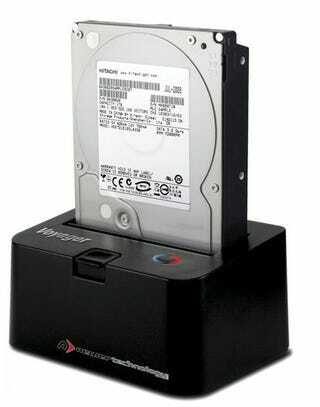 In addition, Voyager is completely hot-swappable for consumers wanting to move multiple drives at will while their computer is on and running. Its unique design and drive eject button makes inserting, using, and removing SATA I/II hard drives a safe and effortless procedure. NewerTech Voyager is priced at $99.95 MSRP and is available immediately from NewerTech’s exclusive distributor, Other World Computing (OWC®), at www.macsales.com, as well as through the retail channel. Voyager includes all its supported interface connector cables and an auto-switching power supply for worldwide compatibility.